Protest and Punishment. The story of the Social and Political Protesters transported to Australia 1788-1868. Queensland - Our Seventh Political Decade 1920-1930. Queensland Politics during Sixty (1859-1919) Years. Nest of Traitors. The Petrov Affair. PETROV V.M. (By N. Whitlam & J. Stubbs). The Three Lives of Gavan Duffy. DUFFY C.G. (By C. Pearl). The Crisis in Victorian politics 1879-1881. A personal retrospect. Ed.by. J.A. La Nauze and R.M. Crawford. Reluctant Democrat. Sir William Denison In Australia 1847-1861. By J. M. Bennett. Foreword by Rodney Cavalier. Staking a Claim. Gold and the Development of Victorian Mining Law. Alfred Deakin. A Biography. 2 vols. DEAKIN Alfred. (By J.A. La Nauze). Australia and the Vietnam War. 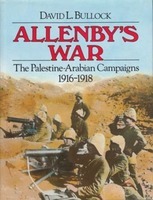 Allenby's War. The Palestine-Arabian Campaigns 1916-1918.